While attending Equinology's gait analysis class at the McPhail Center in October, our group was privileged to attend a presentation by McPhail researcher Dr. Sandra Nauwelaerts, a Belgian biologist. She has just begun to collect her data, so her project still falls strictly into the category of hypothesis, but the potential for impact on the world of equine performance seems profound. 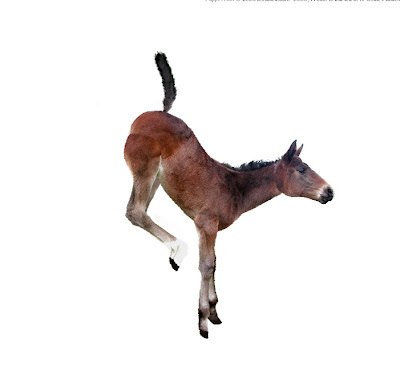 The stabilograms, thus far, show that foals show greater instability, or rocking, cranially to caudally as opposed to laterally, while adult horses — though clearly designed for forward motion— show more lateral sway. While Nauwelaerts does not offer a hypothesis for this (yet! ), she did make the connection between these findings and observing the stability of both lame and neuropathic horses. Thus far, stabilograms from horses with diagnosed neuropathy show a higher instability and more cranial/caudal deviation, than the stabilograms of normal horses. Further, when blindfolds are placed on both sound and neuropathic horses, thus far, those with neuropathy show greater deviation than the sound horses. Additionally, lame horses could potentially show greater instability around the limb that they avoiding loading. The data is still being collected, marker by marker and horse by horse at The McPhail Center, so it is premature to get excited. But for a moment there, in the glow of the gait analysis runway's infrared lights, it was possible to imagine a world where lame horses do not have to be injected with nerve blocks and run in circles, but just asked to stand quietly on a force plate to identify the compromised limb, or where horses with neuropathy can be easily and confidently identified before lengthy and expensive diagnostics are employed. These ideas are, again, only hypotheses and have yet to be borne out by the extensive data collection and analysis that will be necessary for the research to be published. Equinology’s next course in Biomechanics and Gait Analysis (EQ300MSU) with Dr. Hilary Clayton at The McPhail Center is Oct. 12-15 2009. An understanding of basic anatomic and veterinary vocabulary is a prerequisite for this class. Visit www.equinology.com for more information. Hoofcare Publishing would like to thank Sarah for her work as stand-in journalist during the 2008 McPhail Equinology course. © Fran Jurga and Hoofcare Publishing. No use without permission. You only need to ask. Fran Jurga's Hoof Blog is a between-issues news service for subscribers to Hoofcare and Lameness Journal. This blog may be read online at the blog page, checked via RSS feed, or received via a digest-type email (requires signup in box at top right of blog page). To subscribe to Hoofcare and Lameness (the journal), please visit the main site, www.hoofcare.com, where many educational products and media related to equine lameness and hoof science can be found. Questions or problems with this blog? Send email to blog@hoofcare.com.